A repost of the original at the Syracuse Astronomical Society website. We find ourselves approaching the first Society Meeting/Public Viewing of the Summer with (finally!) an excellent Spring viewing session behind us. And it has been a very busy 20+ days for our tax dollars since our last meeting, some of which I’ve tried to summarize (with pictures, of course) below. We find ourselves on the verge of another Summer Seminar that we’re in the process of planning out for late August. In even better news, the SAS regulars for the Public Viewing sessions have found themselves in the company of some new members and new scopes. While timing and our usual Spring weather conditions have not been ideal for some member-specific “on call” outings (I’ve explained to new members that “on call” refers to being ready at a moment’s notice to drop evening plans to take in a good observing night, which happen so infrequently that you risk missing a rare golden opportunity if you don’t scoot up to Darling Hill when the email or bulletin board post shows up), we remain optimistic that a few reasonable nights lie ahead when we can splurge on the petrol to get us all to Darling Hill for some much needed observing. May 25th (the day after our Saturday public viewing on the 24th, which was quite well attended and included plenty of talk about the events of the next day) saw the successful landing of the Phoenix Mars Lander at 125.74922W 68.21883N (or that’s where it looked like through my 25×100 binoculars), in the Mars North Polar Region. This is significant for a number of reasons. 1. This is the first of the Mars Scout Missions, which mark a shift at NASA towards low-cost/high-gain exploratory projects (an important selling point in the current economy, where science is definitely feeling the same budget pinches as everyone else). 3. This has been just about the most exhaustively documented mission to Mars by spacecraft currently orbiting the Red Planet, using cutting edge technology to follow the progress of cutting edge technology. The results have been remarkable. 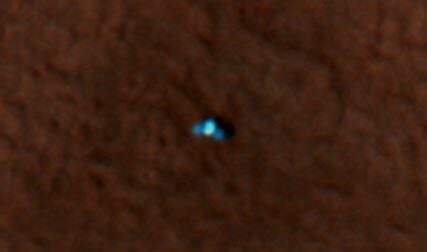 Decent of the Phoenix Lander from the Mars Reconnaissance Orbiter. From photojournal.jpl.nasa.gov. Click for a larger view. 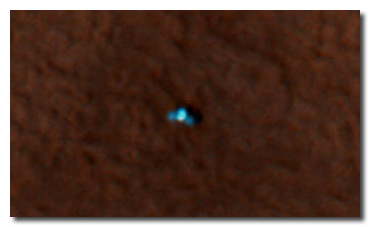 The Mars Phoenix Lander from the Mars Reconnaissance Orbiter. 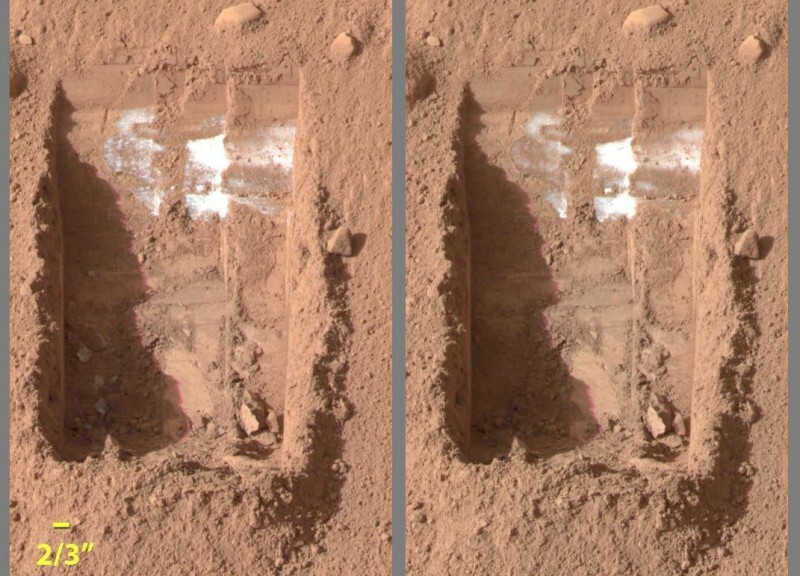 From www.nasa.gov…lander-topviewcolor2-427.jpg. Click for a larger view. …and culminated this past week with the first official confirmation of water (a before-and-after of disappearing ice, but we’ll take it) just below the surface. 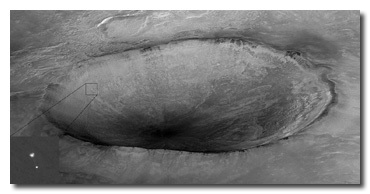 Water ice on Mars! From www.sciencedaily.com. Click for a larger view. And, of course, where there is/was water, there is/was the most important component of conditions necessary for biological processes AS WE KNOW THEM to occur. The lab-in-a-ship facilities on Phoenix will also test some of the other conditions (basic organic molecules). 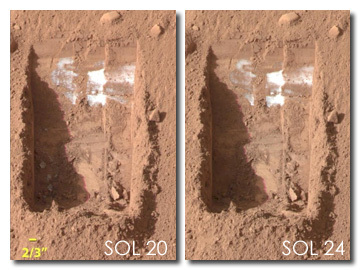 I was quite pleased to stumble upon a “Big Picture” post at boston.com highlighting some of the best images and animations from Mars both on the ground and high in orbit. 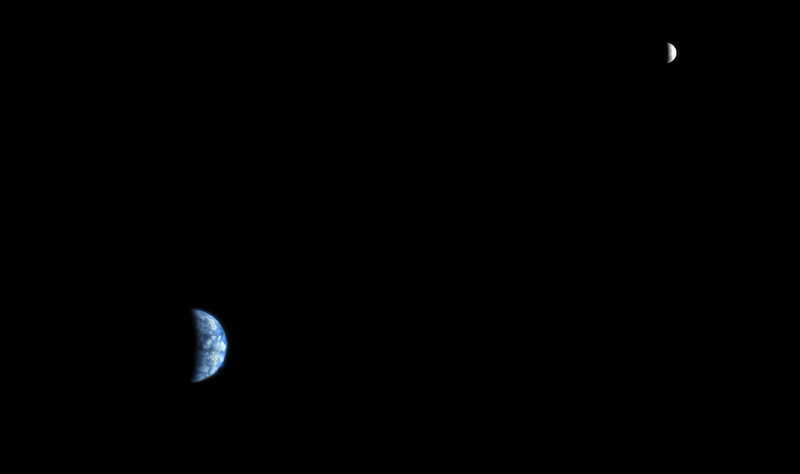 All are available from various NASA pages, but not so perfectly grouped and cropped. A little perspective. 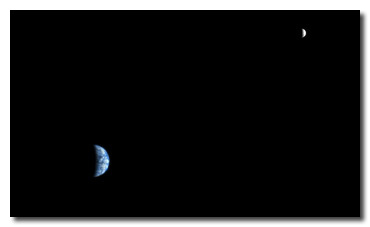 Earth and Moon from Mars. Series at www.boston.com. Click for a larger view. 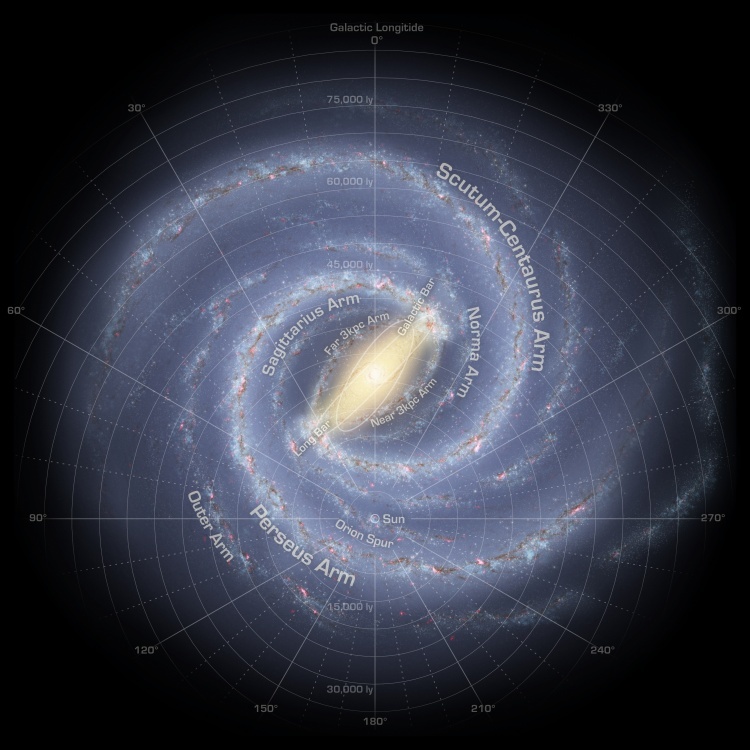 While our Milky Way has remained exactly the same, our understanding of it has undergone quite a makeover this year. In the March/April message, I made mention of researchers at the University of Sydney discovering that the Milky Way is twice as wide as previous determined. Now, researchers analyzing Spitzer Space Telescope data have determined that our previously four-armed Milky Way galaxy is down to a very familiar two. Just like that, the common model changes, waiting for new data to confirm or alter what we think we know about our own galaxy. It makes a scientist feel good to know that there’s plenty, plenty we still don’t even know about our own backyard. A new view of the Milky Way. From apod.nasa.gov. Click for a larger view. The most interesting image to come from this work made the Astronomy Picture of the Day on June 6th and is shown below. 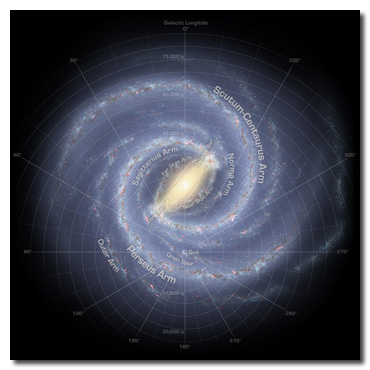 You’ll note our location out towards the outer third of the galaxy in the Sagittarius Arm. Those that have been to a Public Viewing have seen any one of the green laser pointers lase out towards the constellation Sagittarius and remark on how that constellation is between ourselves and the center of the Milky Way (which places it in the vicinity of 0o Galactic Longitude). It is nice to have one’s bearings in the Night Sky! There are probably 100 billion such images on 100 billion worlds around the approximately 100 billion stars in our galaxy that all have themselves at the center of the radial plot. “Dead Sun.” What a depressing thought. Beyond some potential global warming implications and our own discomfort at not being able to understand the one star we can’t do without, reports about the absence of Sun Spots and our lack of understanding about the situation hit me particularly hard because I finally decided that I wanted to take the Bader solar filters I made for my 25×100 binoculars at last year’s Summer Seminar and get some blue sky daytime viewing in. All that work and I’ll have to wait another few years for something to see?! A boring day on the Sun. 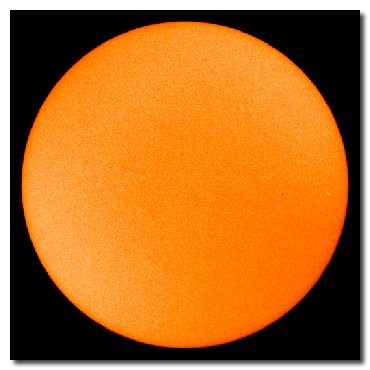 From www.spaceweather.com. Click for a larger view. Admittedly, the headline’s a little tongue-in-cheek, but that is certainly not to say that the situation isn’t something to make astronomers and climatologists think. And, if the Sun went nova right now, we wouldn’t know it for 7.5 minutes, the time it takes the light to reach the Earth (then there’s be the longer wait for all the debris, but let’s not think about it for another 2 or 3 billion years). I was happy to find a number of emails waiting in my inbox last week with content worth sharing from Robert Godfrey, the Rockland Astronomy Club’s own Barlow Bob (why don’t we have one of those? How about a Bino Brady? Recollimation Ray? Spotting Scope Stu?). A few reading this might know that Rockland is the host of NEAF, the NorthEast Astronomy Forum, where good amateur astronomers everywhere can exercise some purchasing power (or fiscal irresponsibility, depending on how far overboard they go) and listen to lectures from the gamut of stellar speakers, from astrophotographers to astronauts. Last year Ray came back with several photographs I posted in the May message. This year I received a link to a number of photos straight from the Rockland source. 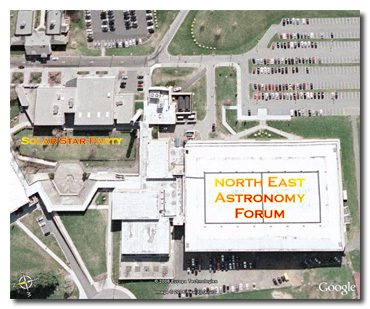 In keeping with the solar observing thread from above, I direct you to Barlow Bob’s slideshow of daytime observing festivities at the Rockland Community College during NEAF. I originally had no idea what the security guard was doing in uniform patrolling the observers, but then it hit me. Here’s a group that spends its nights outside and its days recovering. Given how little Sun they get with their scopes, someone must have guessed the whole lot of’em would be overcome with Vitamin D and go crazy from the heat. Any members that made it to NEAF’08 with stories to tell do send them off for a posting in the July message! NEAF at Rockland Community College. From www.google.com. Click for a larger view.